Dhaka, Mar 23 (Just News): Bangladesh no longer meets the minimum standards for democracy and is under autocratic rule, German-based research institution Bertelsmann Stiftung report said on Friday. ‘Five countries––Bangladesh, Lebanon, Mozambique, Nicaragua and Uganda–– no longer meet minimum standards for democracy’ said Bertelsmann Stiftung's Transformation Index 2018. 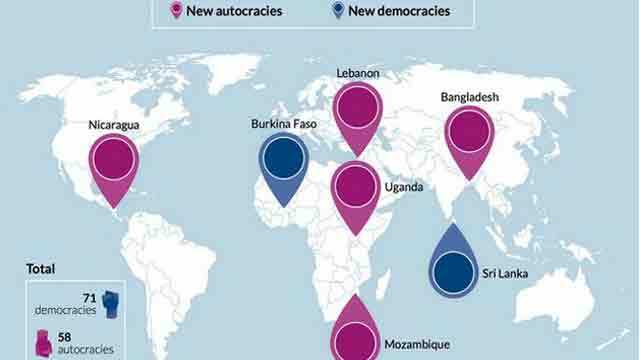 These countries where democracy has been gradually ‘undermined for years, are under autocratic rule. It was often shortcomings in the quality of elections that tipped the balance’ the index report said. The index in its info graphs, while describing reason of political and socio economic deterioration in selected countries, said ‘setback in Bangladesh: due to worsened quality of elections, the formerly fifth largest democracy is classified as an autocracy again’. Since 2006, the Transformation Index of the Bertelsmann Stiftung has been analyzing and monitoring the quality of democracy, the market economy and governance in 129 countries. The current assessment period is from February 1, 2015, to January 31, 2017. Of the 129 countries studied, the index classified 58 as autocracies while the number was 55 in 2016. It also classified 71 as democracies while the figure was 74 in 2016. ‘But it is not so much the slight increase in the number of autocracies that is worrying. More problematic is the fact that civil rights are being curtailed and the rule of law undermined in an increasing number of democracies as well. Former beacons of democratisation such as Brazil, Poland and Turkey are among the countries that have fallen the most in the Transformation Index,’ it said. The quality of democracy, market economy and governance has fallen to its lowest level in twelve years on a worldwide average, said a statement of Bertelsmann Stiftung. Forty governments, including some of more advanced democracies, have curtailed the rule of law over the past two years, and 50 countries have seen restrictions on political freedoms. Only Burkina Faso and Sri Lanka were making significant progress towards democracy during the period under review. By contrast, there are a total of 13 countries, including Mozambique, Turkey and Yemen, where the political situation has become significantly worse,’ said the report.